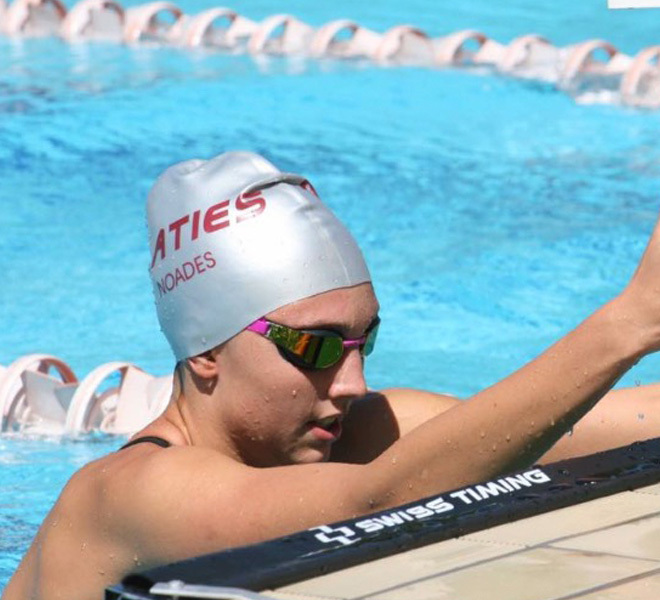 It’s easy to understand why junior swimming champion Kiara Noades is lengths ahead of the competition when she talks about the support she has behind her. “I’ve been swimming competitively since I was 8 years old and I still love every minute of it. I’ve super-supportive parents who don’t put excessive pressure on me. If it wasn’t for that I wouldn’t have the discipline to practice 6 days a week, with only two short breaks from a hectic training schedule every year” says this bubbly, confident 16-year-old. “I am really proud of Kiara and how well she’s managing to build a swimming career, while keeping up her studies in her important senior years in high school. I can see that she’s able to focus better since she’s been taking NeoLife products” says mom, Belinda. “Kiara has a great coach at Stellenbosch University, where she trains. Pierre believes, like me, that one needs to maintain a healthy balance between swimming, schooling and just being a normal teenager in order not to burn out. From my experience as a runner I also understand the importance of good nutrition to maintain performance and longevity any sporting career!” she adds. For Kiara, the proof of her success is on the podium. This year Kiara has done better than she ever has, which includes wins at the African Champs held in Egypt last March. She even qualified for a place in the Senior Nationals – amazingly on the 7th race of the competition. 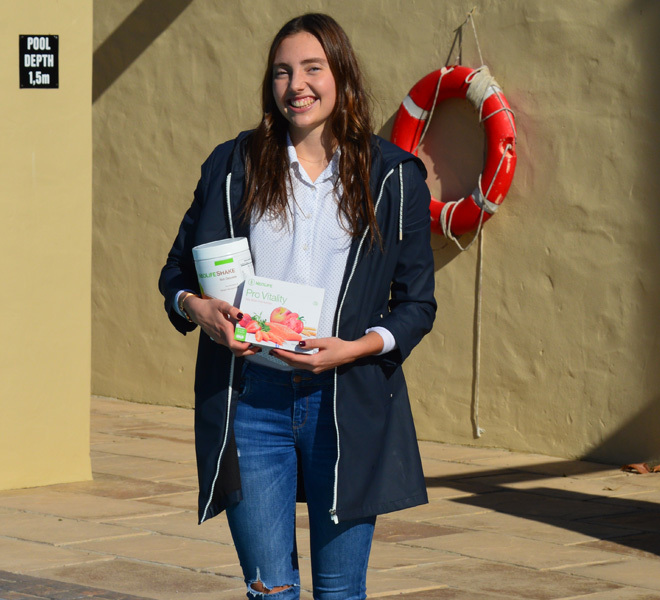 Kiara will jet off in August to Indianapolis, in the USA, to represent South Africa at the FINA Junior World Swimming Championship. Competed at SA Senior National Aquatic Championship KZN - 3 to 8 April 2017. Results: 9th 400m Freestyle; 5th 200m Freestyle; 4th 100m Backstroke; 3rd 200m Backstroke; 1st 4x200m Free Relay; 2nd 4x100m Free RelaY . 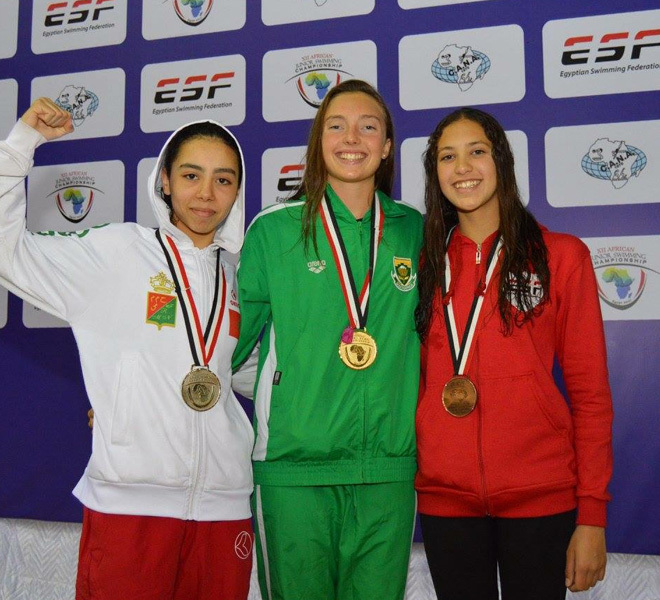 Was chosen to represent South Africa to participate at the 6th FINA Junior World Swimming Championships, to be held in Indianapolis, USA 23 to 28 August 2017.